On a very wet Saturday morning in Dublin I arrived at the Aishling Hotel for a seminar on coping with Advanced Melanoma. There were some familiar faces in the lobby where we gathered to have a quick coffee and chat before the presentations started. Approx 30 people attended which wasn’t a bad turnout considering out of the 900 or so that get diagnosed with a melanoma in Ireland yearly approx 120 have progressed to or are diagnosed stage 4. Liz Yates who is CEO of Marie Keating opened the session with an introduction to the services they provide to patients which included the launch of a new patient advice booklet on coping with advanced Melanoma. I had a good read of it on the train home and although parts make for difficult reading especially regarding end of life care, I wish I had been given it when I was diagnosed stage 4 two years ago. It contains lots of very useful information on treatment and support services for advanced patients something that hadn’t previously been available in one publication before now. 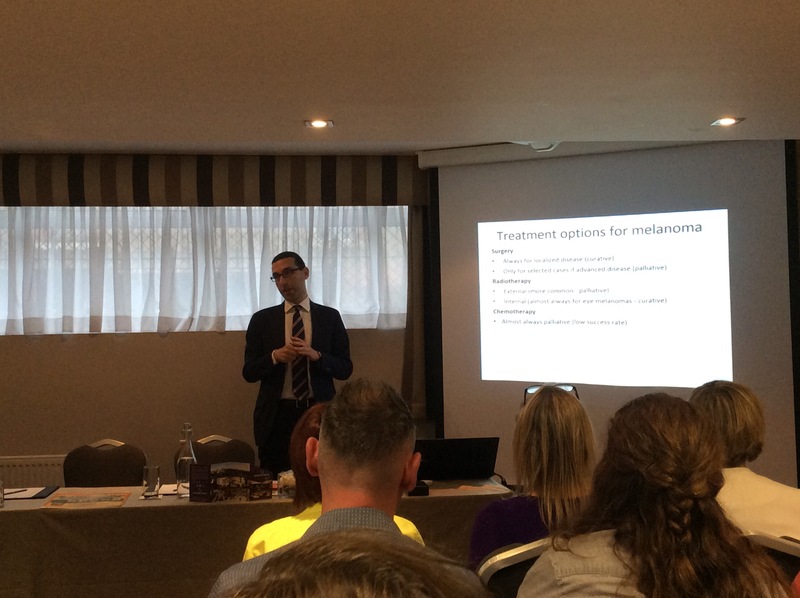 Dr Gullo of St Vincent’s hospital who specialises in treatment of Melanoma was one of the two main speakers of the day. His presentation was very concise he explained clearly the origins of melanoma and the difficulty in some cases of finding the primary tumour where the cancer originated. He explained the different mutations and the complexity of treating melanoma one slide in particular of a cell with all the different cellular pathways and mutations looked like a jig saw puzzle that will never be solved. He went on to explain though the vast improvements that have been made in terms of treatment options which were basically none at stage 4 up to 2011 but now radiate hope for advanced melanoma cancer patients. There is no doubt that patients today stand a hugely enhanced chance of surviving much better than the desperation of a 6-9 month survival pre 2011. He finished his presentation with a case study of a patient who had presented at age 18 at stage 4 they are now age 22 and attending college with no sign of disease after receiving the combination treatment of Ipi/Nivo on a clinical trial the only long-term complications is the need to take steroids for damage to the thyroid gland from the treatment, if that’s not radiating hope I don’t know what is. Next we had a somewhat technical presentation from Dr Lysaght from TCD on the role of our immune system in fighting cancer. It is a fascinating subject and the countless hours of research worldwide has led to the development of immune boosting drug treatments that help our own bodies to program themselves to fight cancer such as melanoma. It is such a different concept to standard chemotherapy of the past and is changing the landscape of cancer treatment for the future. We also got a sense of how bloody complicated the whole process is and the desperate need for continued research so better smarter drugs can be developed for all that give our own bodies the tools to recognise and fight cancer when it rears its ugly destructive head. Thank you for sharing. I’m a melanoma survivor. Yes, there’s hope!! Thank you for sharing. I’m a melanoma survivor! There’s hope! I’m grateful for my life being spared. No complain about the residual side effects!